You have the right to get excited: NBC has announced that Season 6 of Brooklyn Nine-Nine will premiere on Thursday, Jan. 10 at 9/8c, which will serve as its regular time slot. Current 9 pm occupant Will & Grace, meanwhile, will shift to 9:30 beginning Thursday, Jan. 31. 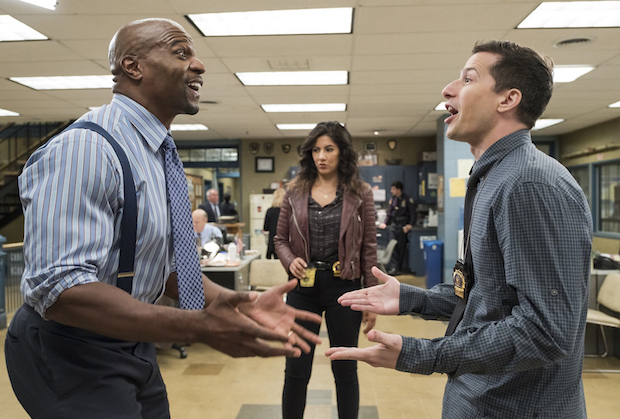 Brooklyn Nine-Nine‘s season premiere will initially be followed by a new Good Place at 9:30 pm. The Kristen Bell comedy will air in that time slot through its Jan. 24 season finale, after which Will & Grace takes over. Struggling rookie sitcom I Feel Bad, currently airing at 9:30, will complete its Season 1 run in December. A decision on the series’ future will be made at a later date. Superstore will go on a temporary hiatus following its fall finale, returning to the Thursday lineup in March. Filling the 8-9 pm void will be The Titan Games, NBC’s upcoming athletic competition series hosted by Dwayne “The Rock” Johnson, which will premiere on Thursday, Jan. 3, at 8 pm.